Here follow a few things that have caught my attention recently. Diotima Sophia (the contemporary one!) has edited Out of Arcadia: A Devotional Anthology in Honor of Pan. It’s another in the rapidly growing Bibliotheca Alexandrina (the press of NeosAlexandria) line of devotional anthologies, and is now available. It features great cover at and interesting reading, including Michael Routery’s “Pan’s Arrivals: Epiphanies and Invocations in Modern Literature and Lyric””, Sofphia’s “Pan and the Feminist Consciousness”, and P. Sufenas Virius Lupus’ “From Arcadia With Love: Pan and the Cult of Antinous”. One of the many positive things that came out of PantheaCon 2011 is alliance building between Hindu and Pagan communities. See the excellent guest post at The Wild Hunt on this by Mihir Meghani, M.D. http://wildhunt.org/blog/2011/03/guest-post-caste-cows-karma-and-magic-at-pantheacon-2011.html; Board Member & Co-Founder of the Hindu American Foundation (www.hafsite.org). However one feels about the concept of Proto-Indo-European, there are many commonalities among European mythologies and indigenous religious systems and those of India. Alwyn Rees and Brinley Rees showed many parallels between Irish and Hindu myth and deities in their classic work Celtic Heritage (perhaps over-doing it according to some commentators) from the similarities between ‘gods of the dead’ Yama and Donn to the primal goddesses Danu of both Ireland and Vedic India.. So Celtic Recconstructionism and Druidism among others make natural allies with that rich world known as Hinduism. For those who live in urban spaces in the western world signs of the Indian Diaspora, particularly in the public visibility of statues of Hindu deities, are common. One of the most visible, and seen in many shop windows ,is Ganesha. The lord of obstacles—and their removal— has been said to have become a ‘global’ god, journeying out from the precincts of Hinduism and approaching people of many spiritual paths (and none). It seems he is an ambassador of Hinduism. 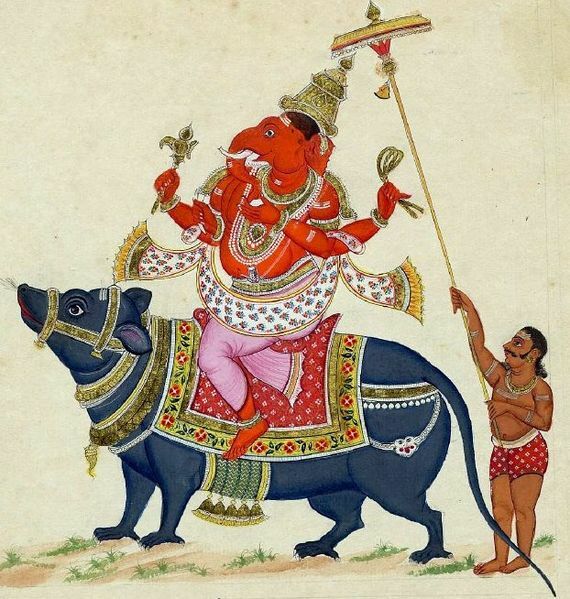 Westerners have actuallly been fascinated by Ganesha for a long time; Richard Payne Knight’s A Discourse on the Worship of Priapus, and its connection with the mystic Theology of the Ancients included a discussion of the elephant-headed god in 1786. Phil Hine at Enfolding.org has a lot of interesting things to say about Ganesha, both historically and in terms of practice: http://enfolding.org/ganapati-variations-an-eighteenth-century-interpretation/. One of Ganesha’s roles is gatekeeper. A magnificent Ganesha statue stands at the entrance to the floor that houses the Indian collection of the Asian Art Museum (which was formed originally to house the collection of Avery Brundage, a once Olympic athlete and president of the International Olympic Committee from 1952 to 1972) in San Francisco. The museum is full of sacred art, including a wonderful collection of Shivaite art and many paintings and sculptures of Ganesha http://67.52.109.59:8080/emuseum. Yet the thirteenth century Ganesha at the top of the escalator is the only sculpture where sanctity is emphasized. Visitors can offer coins, etc. Inside the space seems too small for the artworks displayed. I have talked to Indians currently residing in San Francisco who were impressed with all of the Indian art exhibited in the permanent collection, but wished for more respectful lighting and the possibility of simple offerings like incense and flowers to be placed in front of the various deity statues. Many museums have come a long way from when they were basically repositories of colonial loot, but how to respectfully display sacred art remains a complicated question. Certainly, sacred art can be one of the best portals into a tradition. May Lord Ganesha help open the ways for Hindu-Pagan alliance in the world!